Following the pattern of earlier dynasties the high point of the Tang dynasty was followed by a period of turmoil. The fifty years between the Tang and the establishment of the Song is given the name ‘Five Dynasties and Ten Kingdoms’ which aptly describes the internal strife. Some important developments were still made despite the apparent political chaos. These include the first use of gunpowder and the continuing tradition of binding the feet of young girls. The forced bending of the feet produced tiny 'lily' feet that prevented women from walking easily and was seen as a badge of prosperity - a household that did not need women to do manual labor must be well off. The printing of books, which had begun in the Tang dynasty gathered pace. This development enabled the Five Classics of Chinese literature to be printed for the first time in 953, which had a great influence on scholarship throughout the following centuries. 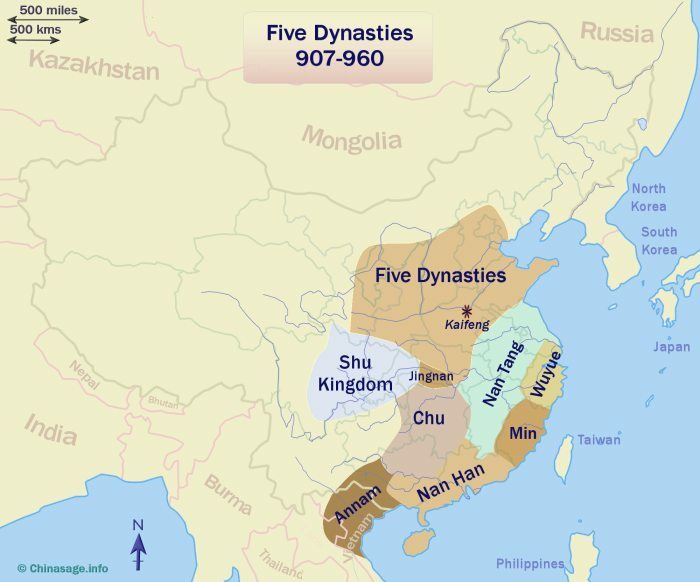 The names of ‘Five Dynasties’ are: Later Liang (907-923); Later Tang (923-935); Later Jin (936-947); Later Han (947-951) and Later Zhou (951-960) none of them lasting more than 17 years. The Emperors were essentially military leaders who usurped power for themselves and their families for a brief spell, so the term 'dynasty' is an exaggeration. The Chinese love of historical continuity has elevated the northern warlords to the status of 'Emperors' even though the smaller but more stable southern kingdoms were the more logical imperial dynasties. The transitions were confused and marked by turmoil rather than smooth succession; as this was often from father to adopted son not to actual son. In the Later Jin the capital moved to Kaifeng, Henan. Tribes from the north and north-west most notably the Qidan ➚ (Khitan) ruled parts of China for much of this period. There were numerous military coups; the imperial court lacked popular support and sound government. While north China (centered on the Yellow River) had five dynasties, southern China had ten kingdoms, and remained relatively stable and free from conflict. 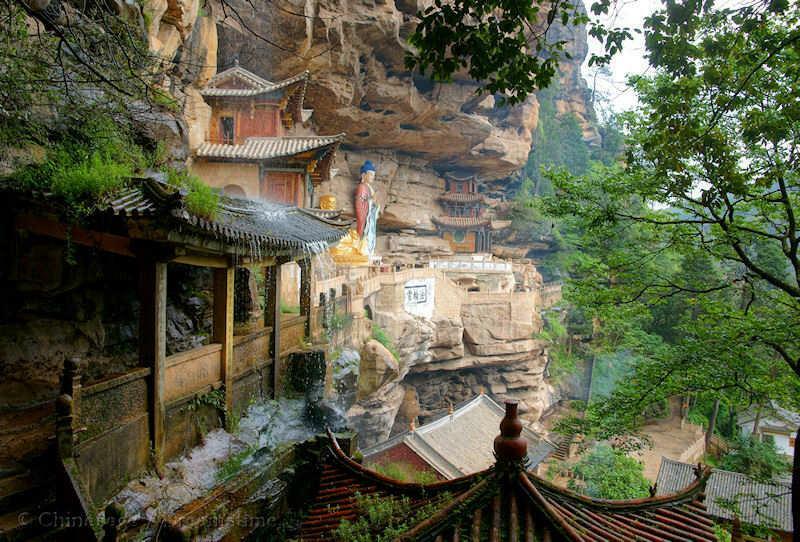 The Shu kingdom with Sichuan as its core area maintained the vestiges of Tang civilization. It ruled an area similar to its predecessor Shu kingdom of the Three Kingdoms era long before. The ten small independent kingdoms were delineated by the Qingling mountains of southern China and proved defensible units of government. The internal conflicts and continuing threats from beyond the northern border of China made it clear to everyone that a large integrated state was the only way peace and prosperity could be maintained for all. Zhao Kuangyin ➚ a General of the Later Zhou dynasty re-united the independent parts into the nation of ‘China’ again to found the Song dynasty. Many of the kingdoms peacefully acquiesced to his overall control rather than resorting to armed conflict. Citation information for this page : Chinasage, 'Five dynasties and Ten kingdoms: China 907 - 960', last updated 18 Nov 2016, Web, http://www.chinasage.info/dynastyfive.htm.